My first attempt at soap making was ridiculous. It was my 31st birthday and I was sporting safety googles and rubber gloves. One judging from my getup may have assumed that I knew what I was doing, but that was certainly not the case. 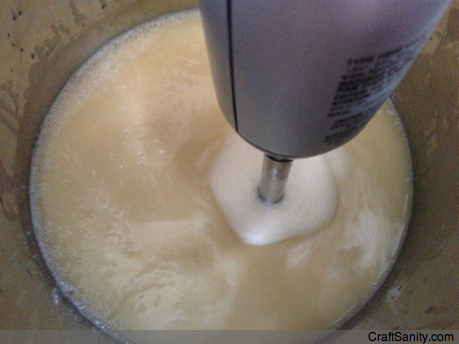 At the time, I was beyond nervous about using lye to make soap, so nervous, in fact, that I bought the wrong kind – a diluted, liquid variety – and hurried home to mix up a batch of soap that would never amount to anything more than smelly glop. It was a real disappointment – that first batch of soap. But I tried again and discovered that soap making is actually really fun when you use the proper ingredients. My second batch was much better than my first, and I’ve made several basic batches since in the six years that have passed since my initial cannonball into the exciting world of soap making. I still consider myself a rookie soaper and up until recently I’ve been sticking to very basic recipes. 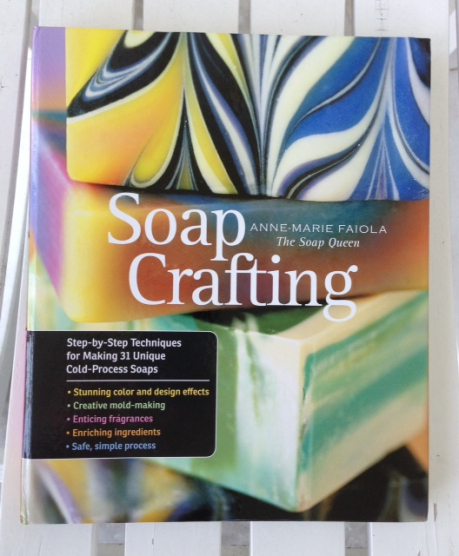 And then Alee from Storey Publishing sent me a copy of “Soap Crafting,” by Anne-Marie Faiola, a.k.a. The Soap Queen, and the book has changed the way I approach soap making and made me wish I had read it before making my first batch. 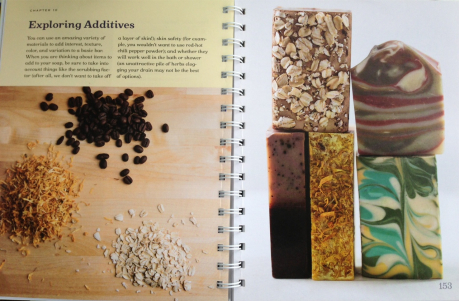 Anne-Marie explains the art and science of soap making in her book that includes instructions to make 31 cold-process soaps ranging from basic beginner soaps to beautiful 12-color Linear Swirl bars that look almost too pretty to use. Whether you’re a full-time soap maker or hobbyist, this book provides a great foundation for all of us to up our soap making game. With sections dedicated to choosing oils, colorants and additives, this book serves as an easy resource to pick up quickly and find the information you need to plan your next batch. I was so impressed by this book that I interviewed Anne-Marie for the upcoming fall issue of CraftSanity Magazine and recorded a podcast with her, too. (Coming soon, folks!) In additional to writing a wonderful book for soap makers, Anne-Marie is a mom and the powerhouse businesswoman who built the Bramble Berry soap supply business from the ground up. She sent me some fun Bramble Berry supplies to try a couple recipes from the book and I’m happy to say I finally advanced from making the same old plain batches of soap in shoeboxes lined with freezer paper. (One of the great things about Anne-Marie’s book is that it includes directions to use shoeboxes, milk cartons and plastic tubs, PVC pipe and cupcake molds, so investing in fancy molds is not required to try the recipes.) 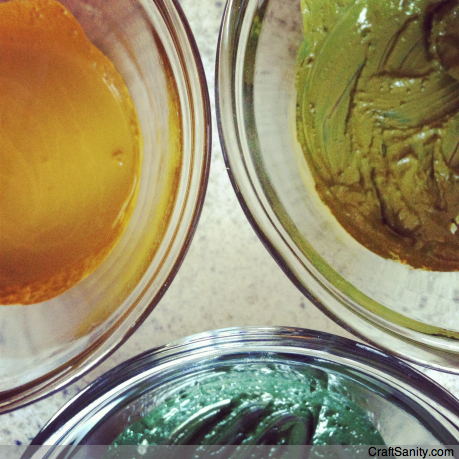 While I do enjoy making and using even the most basic handmade soaps, Anne Marie has expanded my soap world. 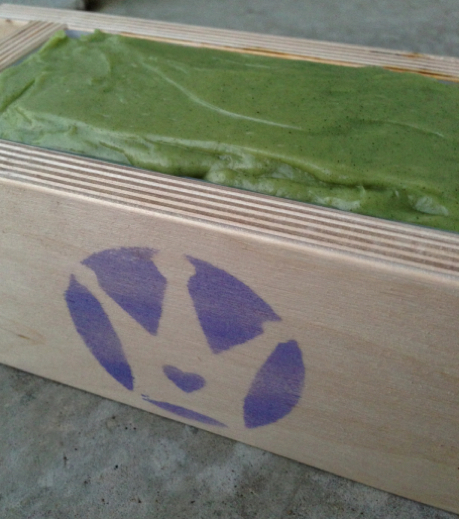 Since virtually meeting Anne-Marie, I’ve made a batch of soap using the natural colorant spirulina, a high-protein dietary supplement that produces a pretty green color, and three-color Avocado Moisturizing Bars. I made the avocado bars first and botched the batch when I got distracted and let my soap pot get a little too hot. The ingredients separated in the pot. I thought I was going to drown in a sea of embarrassment because I was using supplies Anne-Marie sent me to try a recipe from her book and then I went ahead and made a foolish mistake. Thankfully, Anne-Marie had my back when things went south. On p. 234 of “Soap Crafting” she outlines a “SOS (Save Our Soap)!” modified hot-process technique that can be used to save a batch. And let me tell you, folks, it works. These are my rookie Avocado Moisturizing Bars after I accidentally exceeded the recommended cooking temperature for the oil. 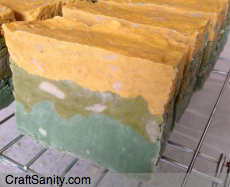 And because I can’t seem to let anything go to waste, I dropped the undyed soap pieces into the mold. At the time I didn’t think through the fact that these would not pick up the color. I was just trying to use it all up. 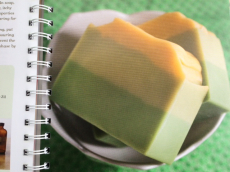 While my avocado bars (below)are not as pretty as the bars in the book (left) due to operator error, I saved the batch and felt empowered when I was able to solve my own problem using “Soap Crafting” as a reference. And that’s the mark of a great book – one that equips readers to troubleshoot and be self-sufficient in a pinch. LOVE that! And while you don’t need a Soap Queen soap mold to make soap, I was thrilled to try Anne-Marie’s wooden molds with silicone liners. They make the process seem all the more official and it feels pretty darn good to graduate from the shoebox phase of soap making. While I’m using “Soap Crafting” as a reference for making soap to use at home and gift to others, this book is a great resource for those who have aspirations to pursue it as a business. (For best results, start with the basic recipes and work your way through to the marbled and swirled varieties.) From the first batch to the next 100, this book, featuring more than 30 recipes and supporting tutorials, is one to keep on the shelf. It explains all the things that rookies need to know while still inspiring more confident veteran soap makers. UPDATE: WE HAVE A WINNER! 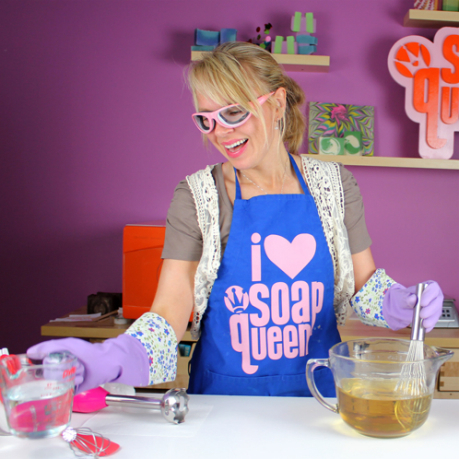 Congrats to Mariah who won the random drawing for a copy of “Soap Crafting.” Enter to Win Anne-Marie’s Book! The folks at Storey Publishing are giving me a copy of “Soap Crafting” to give away to a lucky CraftSanity reader. Leave a comment below by Monday Sept. 9, 2013 to get into the drawing. A winner will be randomly selected and announced Sept. 10. Good luck, everyone! Visit the Oil and Butter blog to read another reviewer’s take on Anne-Marie’s book and see some more book photos. First of all I want to say terrific blog! I had a quick question that I’d like to ask if you don’t mind. I was interested to know how you center yourself and clear your thoughts prior to writing. I have had a difficult time clearing my thoughts in getting my thoughts out. I do take pleasure in writing but it just seems like the first 10 to 15 minutes are generally lost simply just trying to figure out how to begin. Any ideas or tips? Appreciate it!